I know that 95% of self-defense is awareness. I don’t have any actual source to attribute it to and it might be a higher percentage in fact. But I feel like it’s common sense. At Kaju AZ we have been involved with self-defense in our community for more than 11years. We are often asked what is the most important thing about self-defense. Bottom Line: Awareness. How would I personally define awareness? A little bit of paranoia + a lot of paying attention + a large amount of common sense. When I was growing up, it seemed like the world wasn’t such a scary place. Our parents gave us a set a rules for safety and we followed them. Don’t talk to or take candy from strangers. Get home before dark. Be with a friend. Call when you arrive at your friend’s house. As my parents always said: the best defense is a good offense. Where are you and where should you be? Where should you be? We obviously can’t hide in a cave so use common sense. When your parents told you to not hang out in dark alleys, they were on to something. Who are you with? We obviously have to be alone sometimes. But there are definitely times you should never be alone. When your parents told you to use the buddy system, they were on to something. And it is a true at any age. What time is it? 2:00 am is not the time to go to the ATM even if your wallet is empty. When your parents said nothing good happens after midnight, again, they were on to something. What are you doing? Your brain picks up on millions of things happening around you without you even knowing. But you have to be aware to receive the messages. Texting, looking down as you walk, and talking on your phone are just some of the ways you can block the danger signals your brain is sending you. When your parent said to stop goofing around and pay attention, yep, they were on to something. So take the quiz: Where are you and where should you be? Who are you with? What time is it? What are you doing? If you answered in my living room, with my lifelong friend, at noon, looking straight ahead for bad guys then you have a black belt in awareness. If you answered in an empty, dark parking garage, by myself, at 2:00 am, reading this blog post on my phone, then you have failed miserably. Having the power of awareness allows you to be ready for anything. 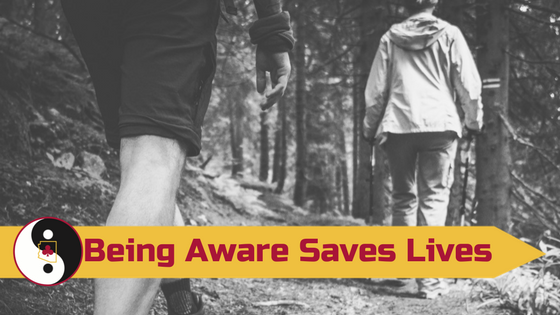 Awareness is critical to being and staying safe. Every situation is different, but awareness is the constant factor for success in these situations.So when you hear your mom or dad’s voice in your head … listen. They were DEFINITELY on to something!